Outback Pest Control is a family owned and operated business based in Clare & Roxby Downs, South Australia. We provide services in a range of locations around South Australia including the Mid North, Upper North/APY Lands, Yorke Peninsula and Adelaide. We regularly travel to outback South Australia, lower Northern Territory, west of New South Wales and South West Queensland. We specialise in the mining industry, commercial industry and general households. Have you got a problem controlling spiders, flies, mozzies, rodents, cockroaches, ants, bees and crawling insects? Are your weeds out of control? Are you building a new house, suspect a termite problem or do you just want piece of mind when it comes to termites? We value our customers and pride ourselves on providing an efficient, reliable and professional service, which is superior in quality. 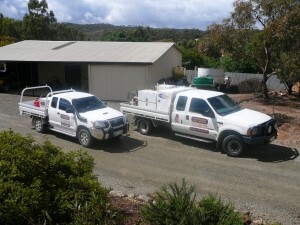 Please contact Outback Pest Control and let us solve your pest problems.